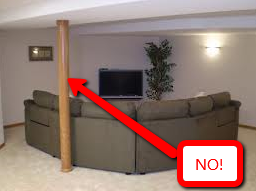 Who here wishes they didn’t have any of those UGLY basement support poles to deal with? If you said yes…that makes two of us! And these columns seem to everywhere we don’t want them to be! Like right out in the middle of our home theater or in the middle of the bathroom…they seem to always be in the wrong spot! So what in the heck can we do about this? Well…believe it or not we have a lot of cool options to work with here…two of which I discuss in the video below. We can’t simply just remove these poles, so we have to think creatively about them when we are designing our new basement spaces. You have to work them into your floor plan somehow so they are not just eyesores that have been boxed-out sitting smack-dab in the middle of your new living space. You have to hide them without it looking like you’ve hid them. In other words…you have to hide them and make it look like they were never their in the first place! This is easier said than done, but not if you know a few tricks of the framing trade! This video should help get your pole hiding creative juices flowing.